Proposals to build an 11-storey block of student flats on the site of a much-loved Leeds restaurant will go before planning chiefs. Developers have submitted plans to build the student accommodation complex on the home of Maxi’s Chinese restaurant, in Bingley Street. The restaurant has been at the location near Kirkstall Road for almost three decades. Leeds City Council’s city plans panel will hear details for the block which could house up to 600 full-time students. 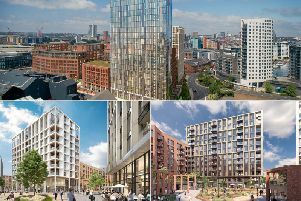 Proposals submitted to Leeds City Council claim the complex is set to become a mix of studio, four, five, six, seven, eight and 11-bed flats, and 360 square metres of communal and social space including a lounge, cinema, gym, games area and study space facilities. A pick-up and drop-off area, space for 82 bicycles and a short-stay car park are also included in the plans. The report from Leeds City Council officers concludes: “The application proposal has the potential to deliver new student residential dwellings in a sustainable location that would contribute to the regeneration of the Kirkstall Road area and offer economic benefits such as jobs during construction and site operation. Maxi’s was founded in 1989 by Raymond Wong. The oriental-style building has capacity for over 200 people. The restaurant also operates two other branches in York, and Leeds Kirkgate Market. The application will be heard at Leeds City Council’s City Plans Panel on Thursday, November 15 at 1.30pm.